We read so much from different Kabbalistic sources, we see ourselves and the world in different potential situations, and it seems that correction is a very complex and difficult thing which is practically impossible. That’s the way it seems until a person understands that all he has to do is to check for and to identify the corruptions as much as he can and ask for their correction. We don’t have to think about how they will be corrected since we can never understand and even imagine what state will come instead of the corrupt state. We only have to want to correct each and every state. Our problem is only in what we mean by the concept correction. Suppose I have a car and I see different malfunctions in it: There is flat tire, a problem in a piston, or in some other part. My request should be not about fixing the car, but about using it. Then I will discover that it is fixed. We have to correct our intention and not the action. This is what we forget, because we want to see the corrected state. But things can be corrected only according to how we can and want to use it correctly, in the right direction, in the right action. Otherwise…the car is on the edge of a cliff, and I have to say in which direction I want to drive it. It will remain out of order unless I choose the right direction, because we “rise in Holiness and not lower in Holiness.” That’s the only way! It is very important to know this: We don’t correct the action but the intention. This is a totally different level of perception; it is as if I choose different glasses in order to look at life, in the derivative. If this is how I begin to see things, then the correction itself is not difficult any more and is not a problem at all, since it isn’t my responsibility. I only have to choose how to use correctly what is being corrected. It says: “make you desire His desire”; if my intentions in using this part of the desire are absolutely identical to the Creator’s intentions, then it is corrected immediately; the Light completes everything. To a certain extent this is a wonder. Look at it this way and it will help you differentiate between the action and the intention, since this is a mistake that constantly drags us to actions and constantly takes us to a plane that is totally irrelevant for us, to a corporeal plane and not to the “human” level. The “human” level is similar to the Creator, and if it is similar, then the Host and I are at the table and the table is only the reason for being connected to one another. The main thing is the intention, the relations between us and not all the delicacies on the table. So don’t look at the world as something that is difficult to correct. On the contrary, sensitivity in identifying what needs to be corrected, that must be corrected on my part, is the whole problem. Question: If a person reaches a certain level of correction, does it affect the rest of the world? Answer: Of course, every person’s correction affects everyone since we are all in the same system. So there is the concept of “birthright,” which helps us advance. How can the concept of “birthright” help us and what is it? Is it some historical documents kept in an archive? Of course not. It is about the correction of the desires. The great Kabbalists, the sages of the Talmud, made a special correction after which we don’t have to through physical penance in order to exit our ego. It is enough to make efforts studying Kabbalah. If I study in a group and want to connect to others in order to discover the Creator in the connection between us and by that bring Him contentment, it is enough for my advancement. I don’t have to torment my body, to beat myself and to be thrown to the ground. Before the correction of the sages of the Talmud, a person had to torment his body if he wanted to reach a spiritual revelation. According to nature’s laws we had to humiliate our physical body and to torment it so that it would want to come out of its skin. Kabbalists in the past made corrections so that we wouldn’t have to use such methods. Our forefathers belonged to the Sefirot: Keter, Hochma, Binah, and Daat (HBD). Then came the sages of the Talmud who belonged to Hessed, Gevura, Tifferet (HGT) and so they are called the “sons.” The period of the sages of the Talmud lasted until the destruction of the second Temple. These Kabbalists corrected the part of creation that belonged to their desire. Therefore, the Light already dressed in the same vessels and became closer to us! We belong to the last Sefirot: Netzach, Hod, Yesod (NHY). 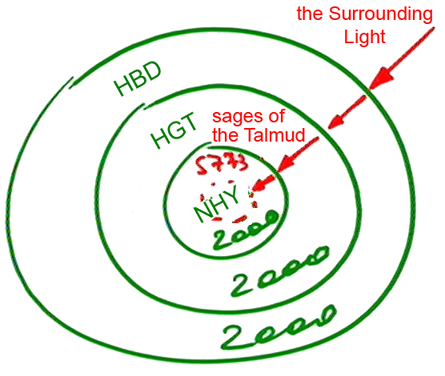 Every period: HBD, HGT, and NHY lasts two thousand years and today we’ve reached the year 5773, which means we’ve nearly reached the end of the 6000 years of correction. First the Surrounding Light reached only the most external circle—HBD. But the fathers have brought it closer by their corrections and it has reached the Sefirot of HGT. The sages of the Talmud brought the Surrounding Light even closer to NHY, and then Kabbalists who lived during the last exile passed on the Light even closer to us. This means that the Kabbalists of the past have prepared for us the corrections which we can now use. It is one general system. By our corrections, we are preparing the infrastructure for the next generation. This help is not only in the books and video clips that we produce; what’s important is that we are preparing a system full of Light for the next generations and are bringing the Light even closer! Thanks to this, the whole world is waking and it isn’t because of some articles or clips on the Internet. Everything wakes from below, through the general system of souls. So the more united we are, wanting the Light to be revealed in the connection among us, the closer we bring the Light to all of humanity. By this we can understand the connection between all the souls, in all the generations. Thanks to each correction, the Light gradually gets closer to desires that are thicker and more internal. As long as we haven’t corrected ourselves, there will be parts of the desire in the world that will not be able to wake up. Question: What does it mean to be impressed by the Creator? You are impressed by everything that you discover within you and surrounding you, in all of reality, that in the meantime you don’t connect to yourself and don’t feel that it is you yourself. You are shown only your inner world in a kind of external mirror so that you will study it better. We need to thank the Creator that He gives us the opportunity to see our inner pictures from the outside, and in this way can learn to know ourselves. If you don’t connect together with the friends, the teacher, and the Creator, then, for certain, you are degrading them. It occurs automatically. If the importance of the Rav, the group, each of the friends, and the Creator aren’t completely equal for you, as something above you, given to you so that you understand yourself and the reality in which you exist, then it turns out that you degrade them. You can’t just value the Creator. It isn’t the Creator if you don’t connect Him to the teacher, the group, the studies, and to all the components of this concept, the “Creator.” The main thing is to connect all the factors together; otherwise, it is impossible to talk about anything that is real and concrete. “There is none else beside Him” signifies that all the rest, except for the single point inside me through which I am able to research the reality, is the Creator. And “the point of breakage” of mine that is separated from me was given to me so that by using this breakage, this special act of the Creator, I will get to know myself and Him. We are both separated by the attribute of severance, purposefully created by the Creator. And only this one point doesn’t belong to the Creator, so that I will invert it into a point of adhesion. And when I begin to work on this point of separation between us, it suddenly turns into five worlds, a black abyss that I constantly try to skip over. To skip, means to connect above this abyss that separates between us. In the News (from DailyMail): “Chicken soup is good for the soul, they say. And as a homespun remedy for everything that might ail you during winter, there are few things as deliciously soothing. “But could such a broth be more than just a cold comfort? According to the latest scientific study, the answer is yes. “Research in the American Journal of Therapeutics showed that a compound found in chicken soup – carnosine – helped the body’s immune system to fight the early stages of flu. “But the authors warned this benefit ended as soon as the soup was excreted by the body, so that means you may need to have a fairly constant supply. “The study wasn’t the first to look at this. More than a decade ago, Dr Stephen Rennard, of the University of Nebraska Medical Center, Omaha, wanted to find out why his wife’s recipe for chicken soup, handed down through generations, was so healing. “Using blood samples from volunteers, he showed that the soup inhibited the movement of the most common type of white blood cell, neutrophils, which defend against infection. My Comment: We shouldn’t laugh at our grandmothers and mothers! It is always like that… but how could they know of the existence of carnosine in broth? My Comment: Fear, uncertainty, and lack of confidence gave rise to religious feelings and sustained religions. If it were not for them and if there were no death, there would be no religion—the mass belief in the unprovable. Kabbalah refutes the religious attitude towards the world. There is Nature and its laws; this is an upper force. And all the feelings that people feel toward the Creator and attribute to Him originate from sensations that are peculiar to man, and to man alone; it is similar to how we attribute certain thoughts and feelings to animals. How Can You Lie To The Creator? Question: It is written in one of the Shamati articles, that you should not lie; but to unite, we often use a game and even such tricks as lying to the Creator or to each other. Answer: This is not a lie, but playing being in the next state. Think about it, how can I be good to someone if I am still a complete egoist? We know that the students of Rabbi Shimon, being great Kabbalists, before starting to write The Book of Zohar each time felt that flames of hatred raged between them and they were ready to turn each other into ashes. Then, what should we do, take our friends and really “turn them into ashes,” to be true and faithful according to our desires? Or conversely, should we begin to rise above them by faith above reason, understanding that the Creator increases our egoism, and we must rise above it? How can we do this if we do not have yet the strength to ascend? That is why in our world we are given the animal state when we are in the human/animal body, in relationships with other animals, and at the same time, our points in the heart are either in a state of getting closer to each other or in a state of rejection of one another. The fact is that we are simultaneously in two planes: in the lower world, which exists in the material, physical form, and in the upper world in the form of contacting points. Our heart is at the lowest level and the points in the heart are at the upper level. But we want to feel and determine our existence not at the lowest but at the upper level. That is why in our world, we are given a sense of opposition to friends, reluctance to be with them. So, we have to get up and play that upper level where seemingly we are already united and wish to reveal a new state among us. This is not a lie, but an attempt, like children to be adults. We absolutely do not hide our ambivalence to each other. It is said that all the students of Rabbi Shimon felt tremendous mutual hatred, and then working on themselves, they corrected themselves and reached that attainment which they then described in The Book of Zohar. Question: What does it mean to judge the whole world to the scale of merit? Answer: It means to attain a level in which I am incorporated in all the desires in the world, in all the souls, in all the parts of the one general soul, to such an extent that it all becomes me. Prior to this, in the previous levels, I already attained my personal end of correction, having totally justified the Creator’s attitude to me in the past, the present, and the future. Until then, all I have in the meantime is my own vessel and I judge according to my feelings in it. So at a certain moment I can say that the Creator is good, but the next day when something unpleasant happens to me, I don’t justify the Creator any more. I cannot annul myself and determine that the Creator is good unless I correct all my vessels. I am constantly in the slingshot, tilting from one side to another each time. When I correct myself, I begin to incorporate with all the other vessels, with all the people, with their internality. By this love for them, I reach the love of the Creator. These are not just nice words that call me to love everyone in order to use them as a means of getting to know the Creator; they are my spiritual vessels! I am increasingly filled with love for them that is expressed by my being able to bestow upon them. Greater desires join me each time, and I work with all this accumulative desire. Suppose I had 50 kg of desire yesterday by which I could connect to 50 people, and today my desire to receive has grown, and I feel melancholy, but I overcome this feeling and rise, and now I have 70 kg of desire. By that I can now connect with several more people. To the extent that I connect with others this way, they become me and all of reality becomes mine. Thus I see the Creator’s attitude to reality, since it is the same thing, just like His attitude to me. It is like judging your attitude to me according to your attitude to my baby. Because I love him, your positive attitude to him is the same as a positive attitude to me. Question: How can I hold the intention correctly when I am not in my proper environment, for example when I am on the street? Answer: It’s very difficult to hold the intention outside of your environment. Here, indeed, you need the friends’ help. When you go outside to the street or start doing external things, various problems arise. You begin to be distracted, and if you drive a car, others honk, whistle, etc. so everything disappears because you can’t yet be in two worlds. So, you constantly need to feel the support of friends, as if you are under the influence from yours or any other group in the world.